Years of advanced hoops analysis have revealed a shocking truth. In order to block a shot you have to be in the game. 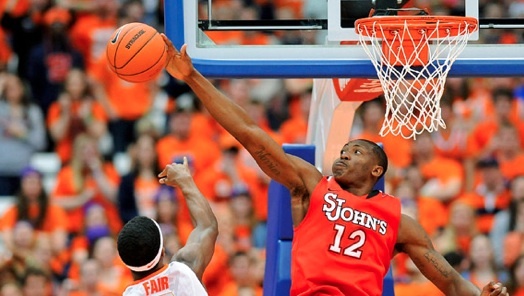 But if you do find yourself in the odd position of talking about St. John’s at some point, I’d recommend starting with Obekpa as opposed to usual suspects like D’Angelo Harrison or JaKarr Sampson. This team is again significantly better on defense than it is on offense, and I’ll nominate Obekpa as the largest single factor behind that good D. Not only does he block a high number of shots, he plays a goodly number of minutes as well. I was mulling how a player whose home court is Madison Square Garden can possibly be under-hyped when I resolved to see if my confusion’s premise had any basis in performance. As a first step I turned to the rather unimaginative but commendably easy recourse of indexing block percentage by playing time. Thanks to the diligence of my friend Ken, we can draw upon 10 seasons’ worth of beastly individual defensive efforts and compare apples to apples and Thabeets to Witheys. I assumed going in that any compilation of the best shot-blocking seasons recorded by recent major-conference players would, inevitably, become an All-Star Celebrity Tribute to Jarvis Varnado. It turned out I was right, but let’s do this anyway. For the next few hours at least I’ve chosen to call this thing eBlk%, because if auto insurance and dating sites have taught us anything it’s that names with a lowercase “e” in front of them always catch on. Now, getting back to Obekpa, you can see he had a pretty fair freshman season and he’s off to a great start this year. At the moment his block percentage stands at a rather robust 24.0, and since Coach Lavin has the young man on the floor roughly 61 percent of the time this nets out to an eBlk% of 14.57. QED, Chris Obekpa is the greatest shot-blocker of the tempo-free era. Or not. You may have noticed it’s still rather early in the season, and, anyway we’ve seen that even Obekpa’s awesomeness isn’t enough to offset Penn State’s Tim Frazier repeatedly and maniacally hurling himself into the Red Storm perimeter D like a crazed marmoset guzzling 5-Hour Energy and getting to the line 20 times in 38 minutes. Even Chris “The Chuck Norris of Defense” Obekpa has seen an opponent ring up 89 points in 76 possessions. But if you close your eyes and imagine this offensively-challenged (and you can remove the hyphen — har!) St. John’s team without one of the most effective shot-blockers in recent D-I history, it’s not a pretty picture. His importance to the Red Storm exceeds his hype. BONUS anti-anti-conventional wisdom! Anthony Davis we hardly knew ye! In the run-up to the 2012 national championship game, hoops poindexters worldwide joined hands and mocked casual fans and their curmudgeonly hoops-whisperer enablers in the media for hyping Anthony Davis as a shot-blocker over the non-first-team-All-American on the other team, Jeff Withey. In truth it was the latter player who had a higher block percentage, so the mockery was fair enough as a guide to proper attitudes when either player was on the floor. But as a sum-up of the relative impacts the respective players had on the 2011-12 season, the casual fans may have been onto something. By playing an incredible 80 percent of the available minutes, Davis inflicted that capacious wingspan of his across the virtual entirety of Kentucky’s non-garbage-time action that season. For his part Withey may have been more help to KU’s defense last year, when his block percentage dipped but he added nearly six minutes to his per-game average. This entry was posted in counting things, florid historical references, hoops on December 2, 2013 by johngasaway.